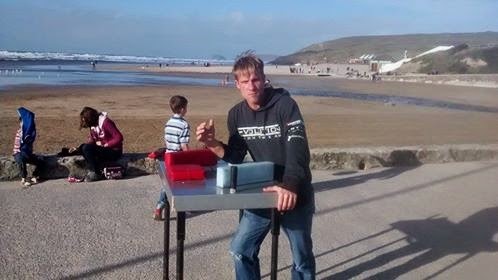 Yesterday I got a message from Kevin Callaby(a former British arm wrestling champion) asking if I was interested in doing some arm wrestling training on Sunday. Having been extremely busy with all the behind the scenes things getting ready to open the gym, I felt I had deserved a few hours to let off some steam and gladly acepted his offer. 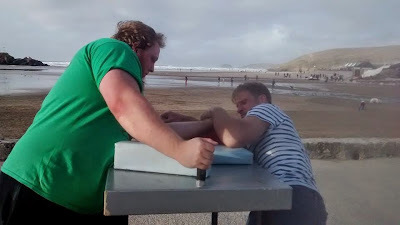 After coming over to pick me up we decided not to arm wrestle indoors but to take his table to Perranporth beach as the weather was not bad and besides who doesn't want to arm wrestle at a beach with great scenery? Kevin Callaby looking ready for business. This is the position i spent most of the day in. All in all it was a great day out and a nice change of scenary than sat behind this laptop. We had some people stop by and take some photos and a few onlookers as Kevin schooled me and even some big guy came to try his luck against Kevin. I learned a lot as I always do when training with Kevin and the more i learn the more i realize how important technique is in arm wrestling as i have almost 50kg weight advantage against Kevin and cannot beat him once he takes any form of control on my wrist. We will be setting up a table at the gym, and will start possibly a small club/technique sessions for anybody that is interested in having a go and learning how to arm wrestle correctly without injurying yourself with special techniques and moves that you can apply. If you are interested please contact kernowgym@gmail.com or join the facebook group run by Kevin.